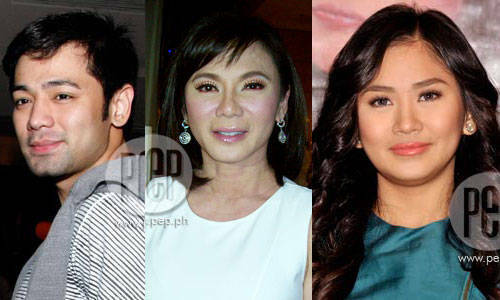 Check out the highs and lows of the celebrity scene in this week's showbiz update! Hayden Kho, Jr. is back in business! Back in Vicki Belo's business, that is. The doctor to the stars told 24 Oras that her ex-lover is back in her life—and that he never really left to begin with. Something heavy's going on in the world of Sarah Geronimo, but she's not telling anyone what it is. All we know is that the lovely young lady with the golden voice has been through some unspecified heartbreak. What do you think happened? We all know that Pinoys are taking over the boxing world. (Hello, Manny Pacquiao.) But did you know that Pinays are catching up, too? The newly-crowned WBO Female Super Bantamweight World Champion is a Filipina! Ana Julaton, nicknamed "The Hurricane," flew in on Monday, a far more welcome hurricane than Typhoon Basyang, for sure! International singing sensation Charice is slated to be on 10 episodes of the hit TV series Glee next season. She's keeping mum about the Glee audition details, but not about the preparations she's been making to take on the role of a foreign exchange student. "Nagvo-voice lessons po ako at pati sa acting at accent. Ang pinakaimportante po talaga yung acting. Doon po kami nagfo-focus talaga." Charice was in Manila to do a series of shows over the weekend. Who's going to host Wowowee now that Robin Padilla has turned down the post? Robin guest hosted the popular noontime show for a very successful two-week run, but isn't looking to stay. Willie Revillame himself seems to want back in. Do you want Willie back on Wowowee? Pink took a terrifying tumble from a stage harness during an acrobatic performance in Germany last week. After being rushed straight to the hospital from the stage for some x-rays, the singer Tweeted that she was strapped into the harness wrong, which was what caused her to fall right into the barricade. Lindsay Lohan's supposed to be checking into a jail cell this week, but she's checked into a rehab facility instead. Maybe LiLo's hoping they'll soften her 90-day jail sentence? Love is in the air! Penelope Cruz and Javier Bardem tied the knot in the sunny Bahamas after years of being together. (The Spanish sweethearts met on the set of a movie in 1992!) Congratulations! Looks like World Cup fever isn't quite over yet! Enrique Iglesias is all set to ski naked in Miami—something he said he'd do if Spain won the World Cup. (Which they did!) What a good sport!